This variety bears delicious oily nuts which are high in nutrients. Bears in about 5 years. Will self-pollinate, but best if you grow more than one tree. Hardy to -30F (-34.4C); height: 30ft. 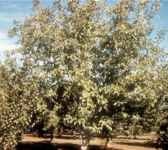 Good solid meaty walnuts are produced on this sturdy tree. Hardy to -20F (-28.8C); height: 30ft. Large handsome tree valued for its wood and for the nuts which it bears. Used often as timber tree, this variety grows quite large and makes a great shade tree. Plant at least 2 trees for pollination. Does well in a variety of soils. Hardy to -30F (-34.4C); height: 100ft.